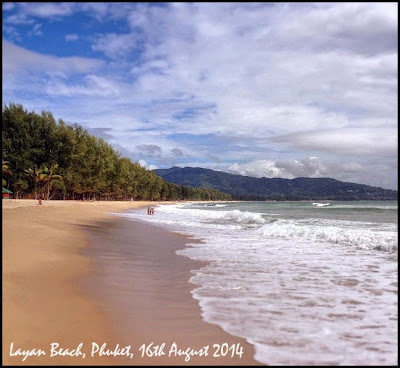 Layan Beach is not at all well known, so if you want to find one of the quietest and most beautiful beaches in Phuket, try to find Layan Beach. Hard enough to find it on a map! We first found Layan in January 2007 on a rather grey day while driving around the back roads in the North of Phuket. Note - this blog post is from 2007, but there's an updated new page @ Layan Beach 2014 Update. You have a choice of small roads to reach Layan Beach. Most photos on this page were taken November 2007. We drove through the Laguna Resort complex, the road turning from good, to bad, to "oh-my-god-i-wish-we-had-a-4wd". The last 100m took about 5 minutes. OK, that's the back route in, you can also go via Naithon, or via Thalang, following a long twisty road through the villages. OK, enough directions. Go find it! Or there's a map at the bottom of the page. Seek and ye shall find paradise. Or at least a very peaceful, picture postcard beach. Layan Beach, just North of Bang Tao Beach, has two halves. The southern part (pretty much an extension northwards of Bang Tao Beach) is simply stunning if you like blue seas and white sand. The land is privately owned, well cared for and kept simple. We were there at the weekend for lunch in the high season and I counted about 12 other visitors and I reckon half of them were local residents. You'll find a small restaurant, a small collection of beach chairs, palm trees and the sound of waves gently lapping the shore. Too good to be true? A little further North, Layan Beach is split by a small island (Koh Kala) and a sand bar, creating a semi enclosed lagoon and a natural paradise. A sign at the edge of the beach says this area is to be made a National Park.. although I read recently in the local news that a marina might be planned for this location. It's a beautiful spot. I'd like to walk out along the sand spit to the island, but not with the little kids - it's quite a hike on a hot day. We've been here for beach BBQ's a couple of times. Not a swimming beach, but of you walk 15 minutes south you get to the beach by the restaurant. (above) Panorama of the north end of Layan Beach - click to enlarge. You'd hardly know it, but there are 2 small, quite exclusive, very nice looking resorts in this section of Layan Beach. They blend in with the scenery, offering beachside or hillside bungalows. If you like a bit of seclusion, the Anantara Resort or the amazing Trisara (on the headland just north of Layan) might be for you. Layan Beach is perfect for me and the family as a little getaway for a couple of hours - we like the small scale, the little restaurant, the fact that the beach is clean and hard to find. How we never found it until 2007 is beyond me.... Well, I guess we are not on holiday so can't be out exploring every day, but it's pleasing that after many years here Phuket still manages to surprise me. Update August 2014 - Just went to Layan for the first time in years. A "beach club" called Nikkis has been built next to the little restaurant, looks ugly from the outside, fancy from the inside. And playing quite loud music. Beach looks great aside from the usual washed up flotsam which you get in low season. No further development around the lagoon area. Still very quiet.